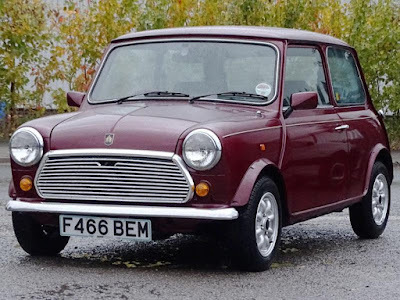 A little red 1989 Austin Mini whose one lady owner had driven a mere 6,500km in her whole twenty-nine years of ownership, equating to a 'miniscule' on-average four kilometres a week, has just fetched an amazing UKP13,000 (AU$22,654) at auction in the UK. Amazing, because that lady had paid a touch over just 1,900 pounds (AU$3,361) when she'd bought her little Mini new all those years before. The concept of the Mini actually goes back a further 30-odd years before that to 1957 when head of the Morris Car Company, Sir Leonard Lord foreshadowed a place for a small, fuel-efficient and budget-priced family car in view of a looming world fuel crisis and tasked his top engineer, Alec Issigonis, with heading up a team of designers to bring about just such a vehicle. Amongst ideas that team conceived was a boxy little auto into which four people could be literally shoe-horned, and which had a transverse engine and gearbox that allowed for a revolutionary, fuel-efficient front-wheel drive – something drivers around the world instantly took to, and which is still as in-vogue today as all those decades ago. And the little red 1989 Austin Mini that's just sold in the UK with that extraordinarily low 6,500 kilometres after twenty-nine years on the road (meaning an average use of just 222km a year, or a touch over a mere four kilometres a week,) still had its original sale contract in the glovebox, original handbook and keys and supplier company's windscreen sticker, and the original 1980's style registration disc holder. And while he's paid around a third more than the 10,000 pounds the car was expected to sell for at auction, its new owner says he bought it both to enjoy driving, and as an investment.